Finally, it’s all yours; your brand-new home. Now that the furniture is in place and the boxes are unpacked – well, most of them – it’s time to think about ensuring your residence is safe for every member of the family. Because you purchased a Chesmar home, you have peace of mind knowing it’s already equipped with a number of safety features such as smoke and carbon monoxide detectors, a security system, and coverings on every operable window. That’s a good start, but the process of childproofing your home is a constant effort. After all, as every parent knows, mischief and misadventures seem to be rites of passage for just about every young child. Here are three tips for keeping kids safe despite their self-destructive tendencies. Your home was designed to provide a safe and nurturing environment, but it’s not a padded bubble. Hard surfaces and sharp corners can be unforgiving in the event of a fall. Install edge and corner guards on furniture and other items such as fireplace hearths to protect against injury. Because of their relative exposure, the corners of coffee and end tables should be at or near the top of your list, as well as hutches, cabinets, and mantels. Doorknob covers are a good way to prevent children from accessing areas of the house that are off-limits, such as swimming pools. Just make sure the doorknobs are still easy for adults to use in case of emergencies. Cover unused electrical outlets with protectors or safety caps. Make sure outlets near a water source such as tubs and sinks are updated with ground fault circuit interrupters (GFCIs), which cut the power if an appliance falls into the water. Rubber spout covers can protect toddlers from bumps and bruises. And since spigots can often be turned by even very young children, it’s important not to set your water heater any higher than 120° F. You can also install an anti-scald device on the faucet itself. These products have sensors that will stop the flow of water if it exceeds a certain temperature. You already know to keep dangerous items such as cleaning products and medications locked away, but there are other potential hazards that should also be kept under lock and key. Toilets, for example. Toilet locks can prevent drownings and prevent the lid from closing on a toddler’s head. In the kitchen, dishwashers should be locked at all times. The biggest risk is the possibility of ingesting the detergent, which often comes in colorful, squishy packets. Always store knives with their blades pointed down and empty the washer as soon as possible after the cycle is completed. If your child is able to pull your refrigerator door open, you should also consider installing a locking latch. Popular lock types include magnetic, adhesive strap, spring-action, and slide, so no matter what kind of door or lid needs securing, you’ll be able to find a lock that suits your needs. Not every household item that has the potential for doing harm needs to be locked away. Picture frames should be placed not only out of reach, but also positioned away from the edge of ledges to prevent them from toppling to the floor if someone slams a door too hard. Cutlery that’s not in a locked drawer should be far back on countertops and beyond the grasp of reaching hands. The same goes with pot handles. If possible, always use the back burner on stovetops with the handles turned inward. Other common household items that should be kept out of reach are candles (the wax is a choking hazard), matches, glass figurines, and clothing, especially shirts and coats with buttons that can be pulled off and swallowed. 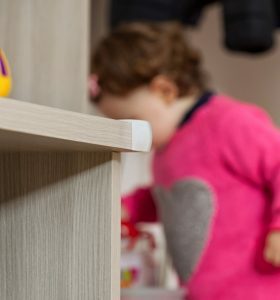 Of course, keeping little ones from harm’s way also includes limiting their access to staircases, bathrooms, unattended kitchens, and laundry rooms. That’s what gates are for, and there are many varieties on the market that can close off just about any threshold or doorway. And speaking of interior doors, consider adding stops to each one to prevent them from being closed fully. Many children are injured each year when a door slams closed on their fingers. At Chesmar, we’re proud of the safety features that come standard with all of our new homes. If you’re in the market for a single-family home in Dallas, Houston, San Antonio, or Austin, contact us today to learn about the many beautiful models we offer.